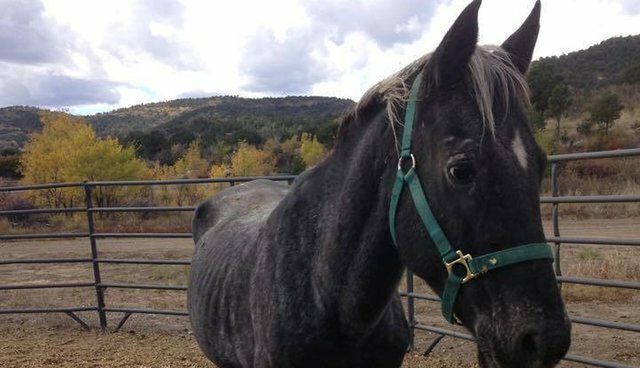 Starving and lucky to be alive after her rescue from a kill pen, this 10 year old Appaloosa mare named Cheyenne lost her three-month-old foal just days before we were able to get her to our facility. When she arrived, she was depressed and unbearably skinny. Since October of 2015, Cheyenne has been on the mend and is progressing beautifully. She has a sweet nature and is very forgiving. She loves attention and wants to learn. When she arrived, she did not understand respect for people and had no idea how to interact in a herd. We are very pleased with Cheyenne's progress with people and other horses and she will be available for adoption in the near future.